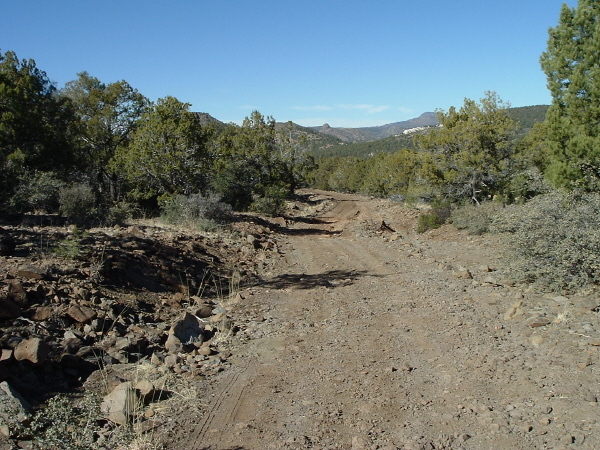 Sheridan Mountain Trail, a multi-use trail, is clearly an ATV trail cutting a wide path through cattle country. The two are truly companions in this neck of the woods. Yet, what compelled me to hike this trail is simple; Prescott National Forest's write up, "This trail is primarily used on horseback. 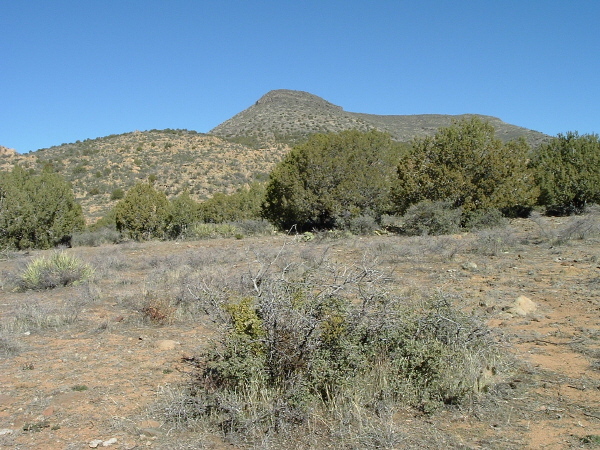 It stays mostly within pinyon-juniper and chaparrel vegetation types. 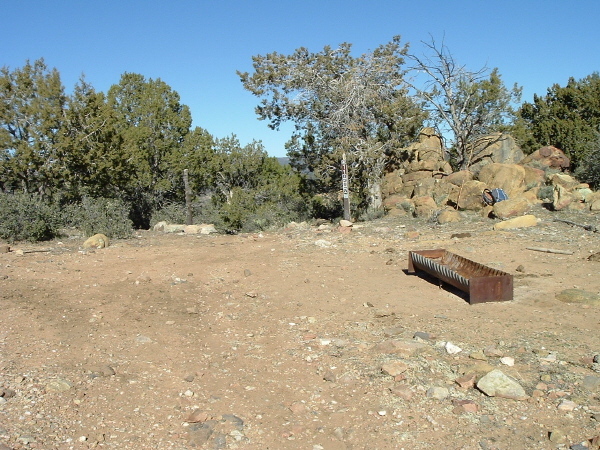 The area, although not classified as such, has a real wilderness character and pass through one of the most rugged and remote pieces of country in northwestern Arizona". I wanted to see this wilderness character having never been in these parts. Arriving at the trailhead later than I anticipated, it was my fault. I had missed the turn off of for Forest Road 705, barreling down Camp Wood Road; listening to NPR, trying to keep from spilling coffee in my lap as I sipped it, and enjoying watching the mountain tops through the trees, blazing brightly from the sunrise behind me. A beautiful morning for a drive, until I realized I missed my turn and cussed myself out for not paying attention. A landmark feature near the trailhead caught my attention. Looking at my Prescott National Forest map I believe it is BT Butte rising 5756 feet. I studied it from time to time while getting ready for my hike, fascinated by it being there, making a statement, "look at me, I am different and I stand alone"! If! And "if" is a big word. If you overlook ATV's and cattle rule the trail, it is a pleasurable hike allowing you to view some serious rugged country. 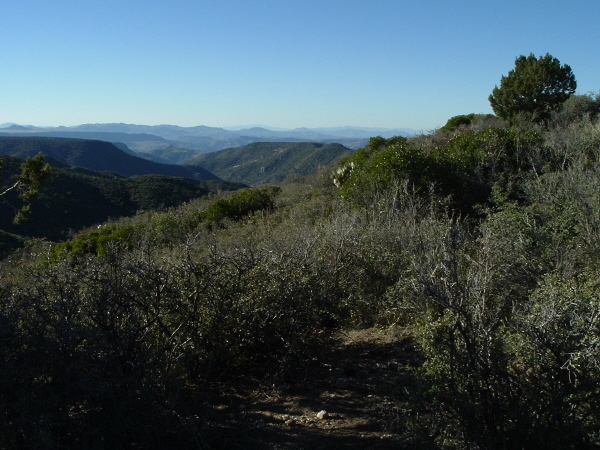 The highest point is quickly reached in a half hour and then the trail meanders down into the folds of the countryside, blanketed with scrub oak, manzanita, junipers, and pinions; the distant peaks, mountains, ridges, and canyons disappear. Hour and a half into the hike I heard running water. A small creek choked with brush crossed the trail and although I did not see the water running, I could clearly hear it babbling on its journey to some unknown destination. I pulled my map out and looked around the area to get my bearings, hoping to find out what the name of the creek was, but none were listed. The only water source I could determine I was nearby was Granite Spring and I am not quite sure of that. Fifteen minutes later I ran into another small creek running. At this point I was surprised the amount of water in the area; however, I reminded myself summer is not here. Near two hours and a short climb beyond the last creek, Sheridan Mountain Trail comes to an end when it hits trail # 13. Beyond a doubt, it is the popular hangout spot for cattle, with a small trough and salt lick inside, the area trampled, ate up, and crapped on! Fortunatily, there were no cows around. I found a nice rock to sit on and enjoyed my break anyhow; snacking on tuna and crackers, and trail mix, while taking in the sights, enjoying the overwhelming silence with the exception of a slight whispering of a breeze, and soaking in the warmth of the sun. After my brief respite I hit the trail. However, rather than go back the same way, I decided to do a circuit hike after a serious review of my maps. I would do this by taking trail # 24, hit Forest Road 705A, and then Forest Road 705 back to the trailhead. When I found the trail by the standard plastic signage indicating a multi-use trail I was floored! No trail, no foot prints, no ATV tracks! Plenty of cattle tracks though. To my left I spotted an old forest service sign knocked down into the bushes, so I picked it up and read, "Bull Water Trail # 24 / 705A 1 1/2 Mile". At least the trail had a name. I placed the sign back in the bushes. 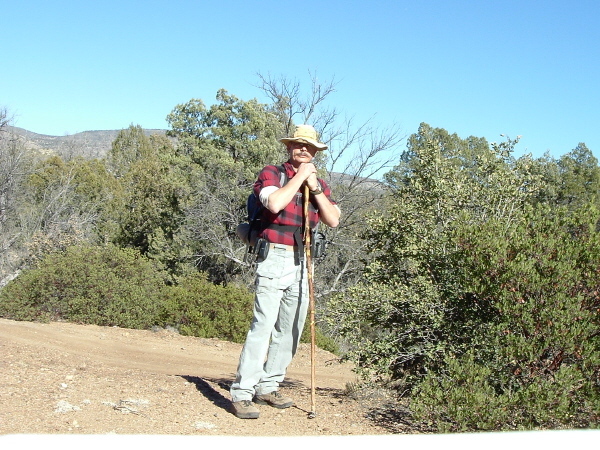 I surveyed the landscape to the east, the general direction I was considering hiking and looked slightly north to study Sheridan Mountain rising 6199 feet into the sky and pondered about what to do. I did not relish the thought of a cross-country, bush whacking jaunt, but then I did not want to hike back the same way I came. So I went for it, knowing the forest road was to the east and I would intersect it as I traveled in that direction and simply keeping Sheridan Mountain to my left. Long story short, I enjoyed this portion of the hike! A bit of a thrill as I worked my way eastward studying, the terrain, and keeping Sheridan Mountain in view. It was easy at first as the ground was pretty much open due to the cattle activity. 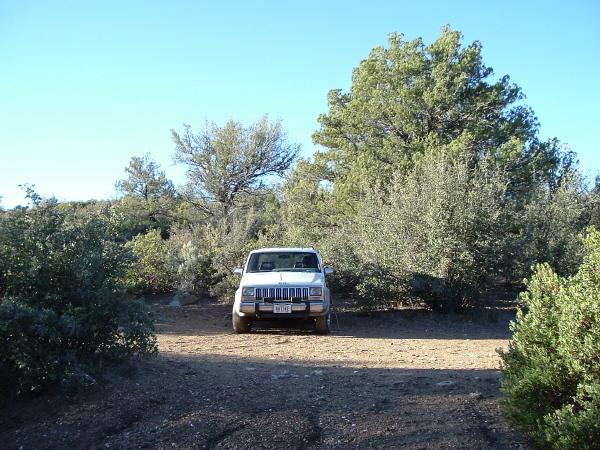 Shortly I found myself in thick scrub oak after passing a creek with pockets of water scattered throughout in it. A couple of times the brush was so thick I had to back track and find some thinner brush I could work through. On occasions I would hit remnants of the trail, the last quater of the mile having stumbled on it by accident and finishing my trek to Forest Road 705A. Must add, on 705A I could not tell there was even a trail, no marker, nothing! From this point forward the hike back to the trailhead was easy and all downhill. And when I spotted my familiar landmark, BT Butte in the distance, I felt good! Like seeing an ol' friend, even though we had just met earlier in the morning. My closing thoughts. As I stated earlier Sheridan Mountain Trail is clearly in ATV/cattle country and they share it. It is evident from the signs around; tire tracks, cattle track, cattle crap, and certain areas trampled down and well grazed. I found only one old track of a hiker, the left foot print. Of course, it could have been a broke down ATV'er having to walk out. And on this day, I did not see one soul, nor did I hear one bleching ATV, just three silly cows running away from me. Interestingly, the trail does not climb Sheridan Mountain, rather it travels around it on the west side. Having said that, it is beatiful country and the view to the south and west is fantastic at certain points on the trail. Prescott FS Reports This trail is primarily used on horseback. 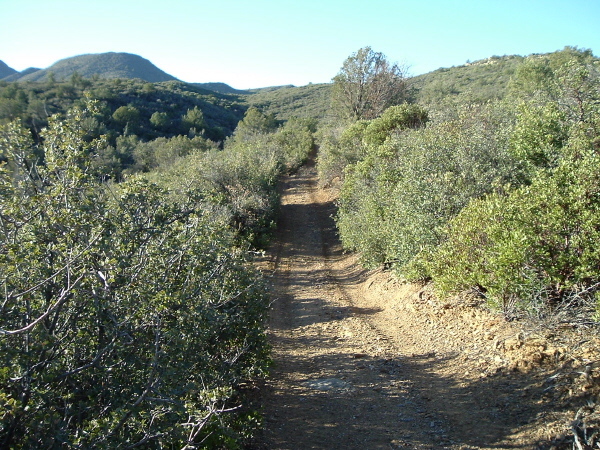 It stays mostly within pinyon-juniper and chaparral vegetation types. 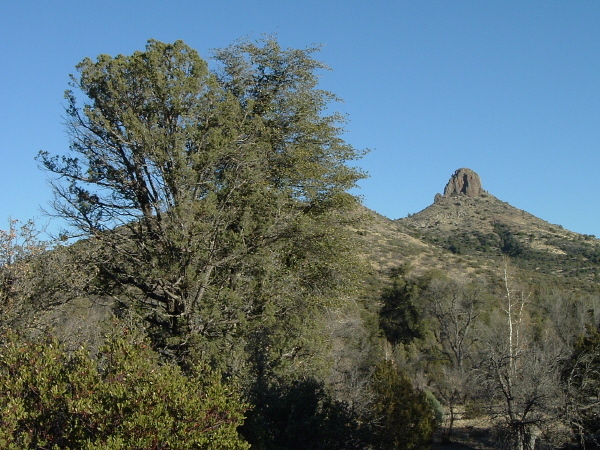 The area, although not classified as such, has a real wilderness character and passes through one of the most rugged and remote pieces of country in northwestern Arizona. Use restrictions: Motorized vehicles over 40" wide are prohibited. Maps, other resources: Prescott National Forest, west half; U.S.G.S. topographic 7.5' quad for Sheridan Mountain. Trail layout: This trail ends at its junction with TR #13 and TR #24. TR #13 continues for about another 1.75 miles to Willow Spring and a junction with FR 705A (4WD only). The rider or hiker can then return to FR 705 via FR 705A. A somewhat shorter return route would be via TR #24 which goes in a more northeasterly direction around Sheridan Mountain and also joins with FR 705A. Precautions: This a rugged hiking trail and there is no dependable water available. Granite and Bull Water Springs are merely seeps and cannot be depended upon for drinking water. In Prescott Valley at the intersection of Glassford Hill Road and State Highway 89A (0 Mile) turn left unto 89A. Head toward Granite Mountain. 9.1 Miles: Turn right on Williamson Valley Road (Yavapai County Road 5). 29.1 Miles: Turn left on Camp Wood Road (Yavapai County Road 68). 44.4 Miles: Turn left on Forest Road 705. This road is a bit rough as it heads down to lower elevation. A good driver may be able to travel it in a passager car. High clearance vehicle would be better. 52.0 Miles: Trailhead. No facilities!